Software wise, this computer had an antivirus client called System mechanic but I couldn’t test it for spyware as it would blue screen, seems like System Mechanic would cause AVG or Malwarebytes to crash horribly. I decided to get rid of System mechanic, and AVG once installed showed the computer has two conventional viruses, Malwarebytes picked up over 26 threats though. Once this was cleaned up I put on Service Packs 1 & 2 for Vista, to lock the machine down against future security issues. An extra 1gb of memory was ordered and fitted, easily slots inside the trap door underneath the machine, a new keyboard is coming from a company in China, this will take a few weeks to get here though. For now I noticed the screen bezel, the plastic frame surrounding the LCD panel has broken as it appears to have been dropped at some point. Here I am going to show you how to remove and replace the screen bezel. This is quite simple, remove the rubber pads which cover the screws as shown, these are just gently prised out with a small flat bladed screwdriver. Next remove the philips screws, there are four in the top and two at the bottom, sometimes there are screws in the side that might need to be removed (like a Dell Latitude I once did) Note the right hand side part of the bezel was cracked so badly, it came off in my hand. DONT use a screw driver to prise off the broken panel. You run the risk of scratching or damaging the LCD or the inverter (the long circuit board at the bottom which provides voltage to the LCD backlight) use sharp fingernails or some wooden or plastic implement, for me this was easy as the bezel was already broken, but if its not coming out, I would use one of those wooden stirring sticks you get from coffee shops and cut and file the edge into a sharp point to prise it off, I would start by easing the top off, on this particular laptop the bottom piece needs to be bent slightly to get the two corners out of the screen hinges. This can discarded now and we are ready to fit the replacement bezel. This is very simple, bend the bottom gently to get it to fit inside the two hinges, the rest just snaps into place, double check all the edges feel flush, you may need to slide the screen latch to get the hooks aligned with the gaps in the new screen bezel. You can now re-fit the screws and the rubber pads. Removing the LCD panel is quite easy, its is very fragile, so it would need to be gently removed by holding the edges of it only and the flat cable on the back of the LCD and the wires for the screen backlight can be disconnected. 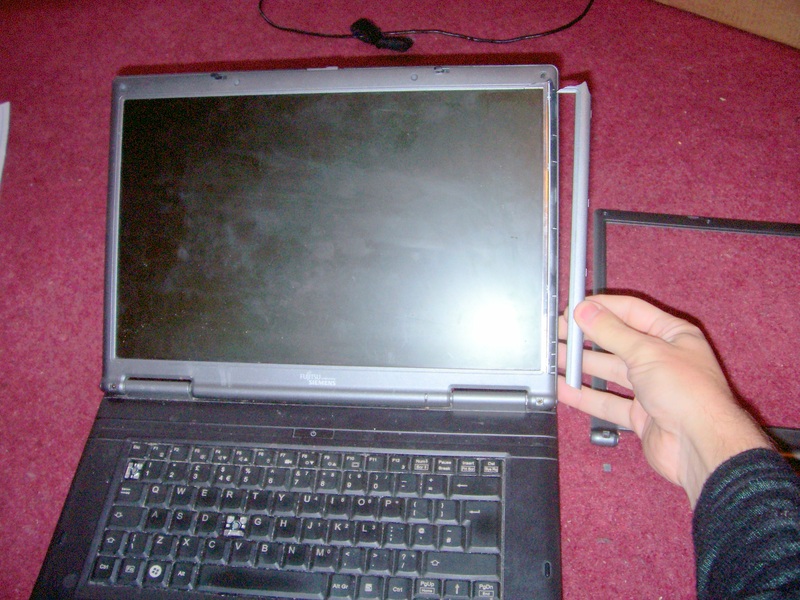 Here is the laptop done with the broken bezel next to it. The cost of the new bezel? £5 including shipping! The company I bought it from on ebay appeared to have too much stock of this part I think! Jonathan is not working at the moment, but welcomes any offers to do laptop or PC repair work in return for a donation towards his second trip to Jerusalem to carry on doing IT support and administration for Bridges for Peace. This is purely a voluntary position and not waged so would appreciate any kind of rewards for IT consulting or donations of course. He is hoping to fly again possibly early March. Hi there, sorry to bother u, but I’ll really appreciate it if u are willing to give some advices.. 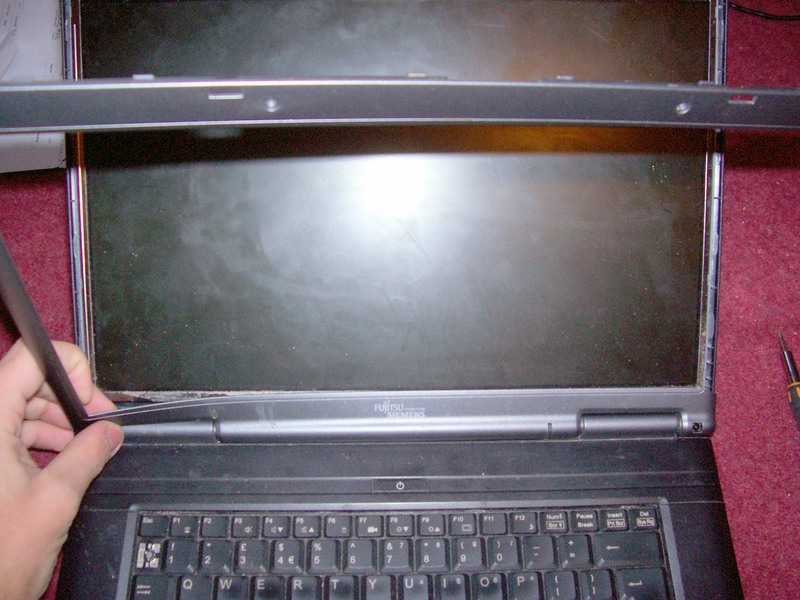 I dropped my Acer aspire 3820TG laptop two days ago, and now then I notice that the screen bezel( on the upper left and upper right )is bent/broken and there are small openings (0.3cm on the left and 0.1cm on the right) that exposes the inner parts. Can I just tape it up? or get a new screen benzel? By the way, there’s nothing wrong with my lcd display now. I replaced an LCD panel on an Acer Travelmate, do a search on my blog and you can see how I took the screen fascia off. 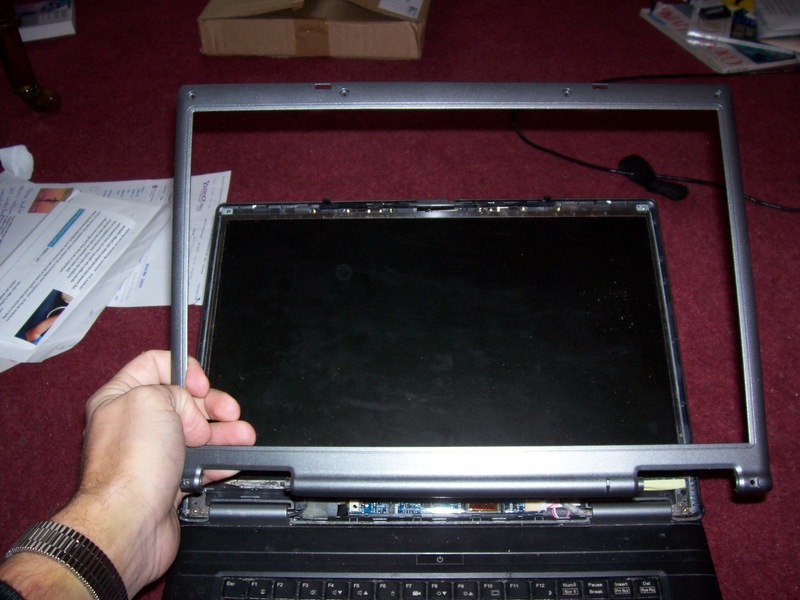 With a broken fascia it might mean theres less rigidity on your laptop and more chance of the fragile LCD getting damaged. I would look for a new bezel, however I can’t see one on ebay at the moment, seem like your machine is recent model. I would just check now and then and you should be able to find one. The write-up provides proven useful to me personally. It’s really educational and you really are certainly quite experienced of this type. Article like this reminds me back in the days when i was joining the computer repair trade. I will surf the entire net and gather everything regarding screen replacements and then wait patiently for next job to actually perform the repair. It was very exciting now am advanced and doing my thing. Keep it up and the entire nation will be educated in the near future. Bad for business though!